Erik Guay, Man on a 24 Hour Mission. Typical of many News related articles, this story was intended to focus on one feature, but when you get to the heart of the subject and after a bit of homework, you realize there’s another, far larger and meaningful story that needs to be highlighted. 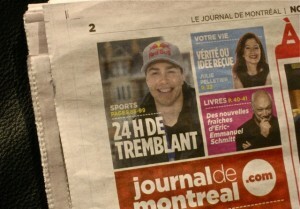 We were absolutely thrilled and very much excited to have the opportunity to speak with Erik Guay, Tremblant’s own 2011 FIS Alpine World Cup, Downhill Champion, who has taken on a lead role as Ambassador/Spokesperson for the 24 Hour Children’s Charity Fundraiser event, hosted by Tremblant Ski Resort, and now in it’s 12th year, Dec. 6th, to 9th, 2012. 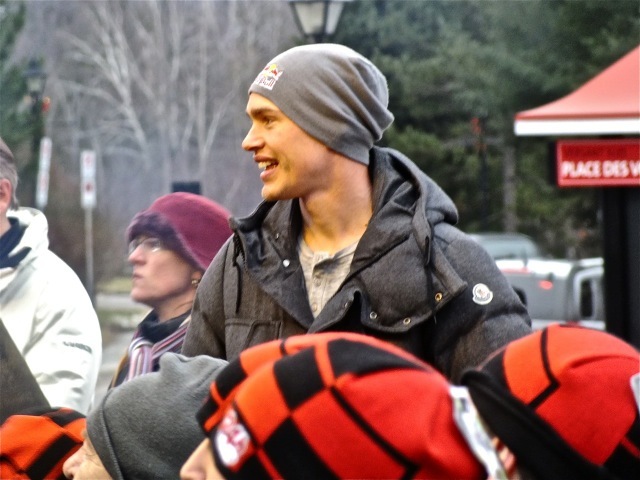 Dec. 7th, 2012, Erik Guay attends the 24 Hour Marche Fundraiser Arrival at the Tremblant Ski Resort. Being a World Cup Downhill Champion primarily means that on a series of Certified, FIS Sanctioned, Officially Recorded, Downhill Race Courses for that year, you are the fastest Human Being on Skis. 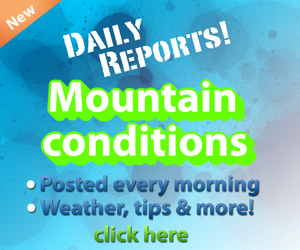 This is a very significant achievement because the “Downhill” event in the roster of World Cup disciplines, i.e. Slalom, Giant Slalom, and Super G, is the “Poster Child” for Global Appeal and High Profile. The absolute speed of the Downhill event is what keeps the crowds coming back to the event, but perhaps more importantly, draws millions of Alpine Winter Sports Fans that eagerly tune in by television around the world to watch this battle between the fastest men on Earth as the Pride of all the great Ski Nations of the world are on the line. Athlete’s from Global dominators such as Austria, France, Germany, Italy the U.S.A. Canada and many others are cheered on to victory by viewers all around the planet in races where recorded peak speeds of 152 KMPH or over 95 miles per hour have been achieved. Even at these life threatening speeds, races are won/lost, Championships are won/lost, all by 1000th’s of a second. The competition is breathtaking and Erik Guay is a National Hero because of his Victories in it. Erik Guay fit’s right in with Canada’s unique place in FIS Downhill and World Cup Chapionships as the very first FIS World Cup Championships ever, were won by Canadian Skier Nancy Greene on the Women’s side in 1967 and 1968. 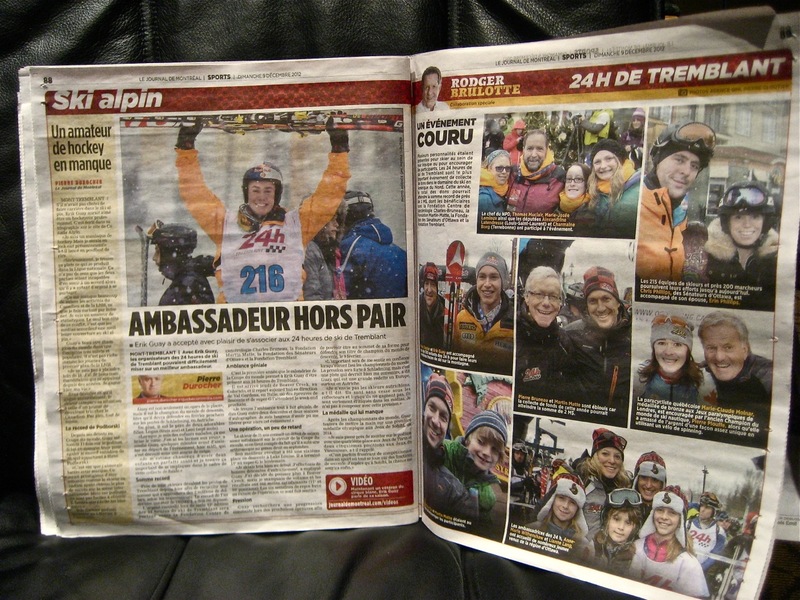 That makes Erik Guay part of both Canadian and World Ski History, and it also brings us back to our story of Erik at the 24 Hour event here at Tremblant. This is where we get to the heart of Erik Guay’s humble and unassuming character. His reply was basically that he feels privileged to be able to add his voice to an event of such already large stature, and that he was impressed to both see and realize just how big the event is and how much momentum it already has. He specifically stated that it compares well with anything else he’s seen on the Global stage. Within the context of his remarks was this very humble overtone that he felt his role was perhaps a small part in a much larger and already very well established Sick and Underprivileged Children’s Charity Tremblant Community project, and as a father himself, he can relate to the concerns that any parent would have for a child in need, and that he hoped his participation would add to the event’s momentum. 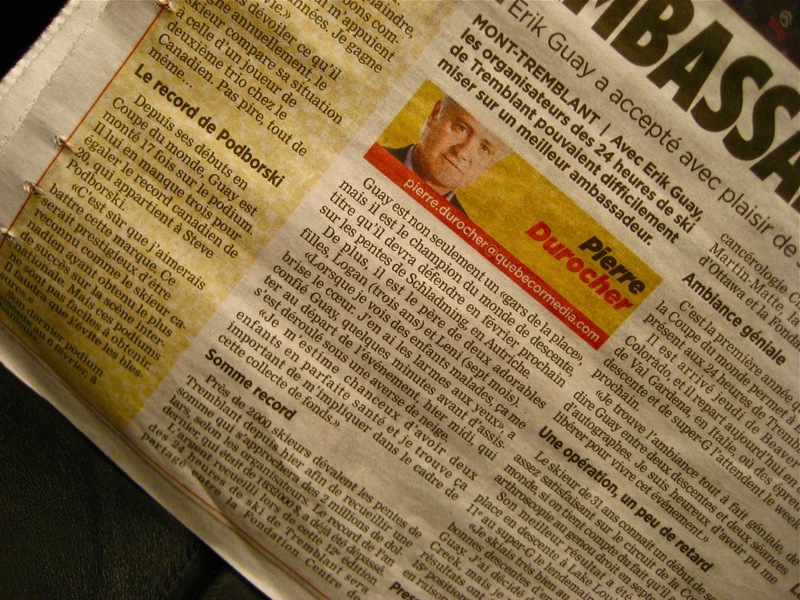 This is the point at which we can tell Erik and you, that his efforts worked and worked very well because evidence of his immediate and very positive contribution literally walked in the door before the event was over in the form of Le Journal De Montreal, for Sunday, December 9th, 2012. 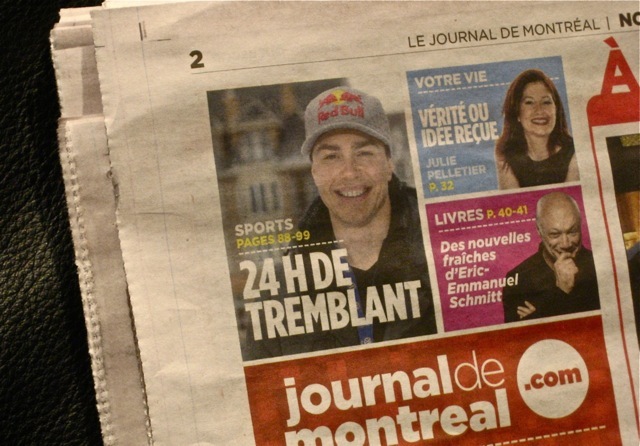 Le Journal de Montréal, is a daily newspaper distributed in Montréal and across the province of Québec, with the largest circulation and readership of any Québec daily, with 1.9 million copies sold and 2 million readers per week. Simply stated, it is an institution in Quebec Society, one of the single most important voices within the local, regional provincial and even national communities. So then, this is not just a story about Erik Guay and how he spent time with a nice group of kids on the slopes, sharing his joy of the sport, as it started out to be. This is really a story about what happens when Erik Guay is around, and we can tell you with what follows, it’s a big story at that. 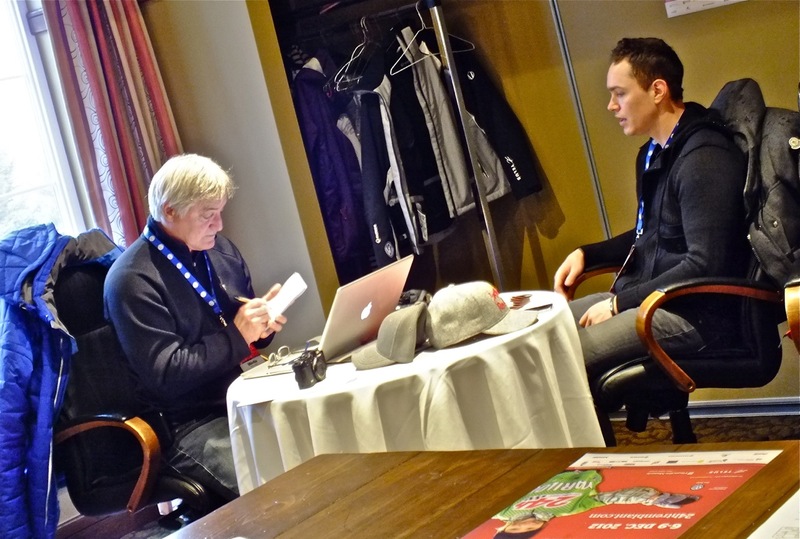 We just happened to be in the Tremblant Resort Pressroom at the time as Le Journal’s columnist, Pierre Durocher, was conducting his interview with Erik and we were fascinated to be a witness of the dynamic between the two. There was a back and forth exchange in which Erik clearly demonstrated his ability to be articulate, intelligent, thoughtful and modest. 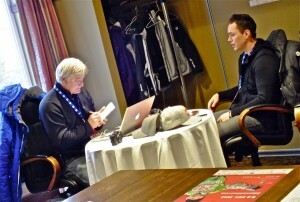 M.Durocher was focused and attentive and very clearly engaged in the interview process. It was a serious conversation and the outcome was a complete, thorough review of the event in the pages of the newspaper on the following day, published early and in the hands of readers while Event Participants were still on the course. As we were going through the paper beyond the article itself, we came to the essence, the point of this entire Blog article…. 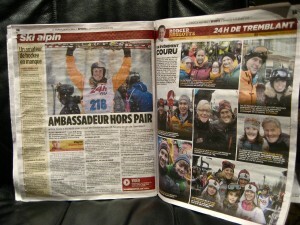 Erik Guay got the 24Hour Children’s Charity Fundraiser a “Page 2” upper left hand corner, priority News Flash Picture and Reference that would have taken literally millions of people to the article about this noble cause at a Ski Resort up North, and that, Dear Readers, is Big, Very Big. 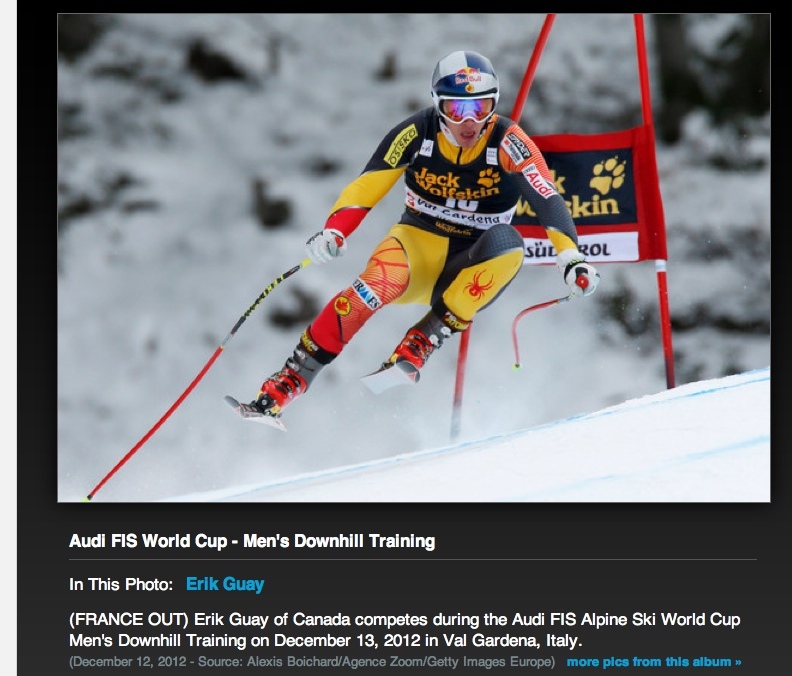 What happens when Erik Guay is around? Big things, and Good things, like taking the voice of a Noble Cause, a cause that so directly effects the lives of sick and underprivileged children, and extending it out to millions of potential supporters with a singular effort. 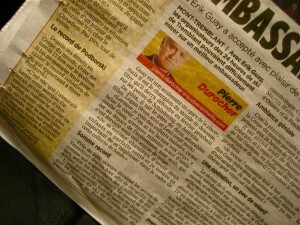 Merci Erik, your voice has helped more than you know. 1) For the record, the 2012 Edition of the 24Hour Children’s Charity Fundraiser generated $2,045,391 in pledges, up over $200,00 from last year. There were 217 Registered Teams with an increase in participants of over 400 from last year for a total of 2000, and the 24 Hour Marche, Walk event had 38 teams, 176 participants and raised $223,623 in pledges. The total raised over the span of the events history is $12,000,000. 2) The 13th Edition is scheduled for December 5th to 8th, 2013. 3) Erik participated in the 24 Hour effort in between European World Cup Events. The fact that he fit Tremblant into his schedule during one of the most stressful times of competition and training speaks volumes about both his character and his priorities. Here is a photo we’ve added to the article on an “After” basis, taken early on Dec.13th,2012 in Val Gardena, Italy…talk about quickly adapting…. We hope that Erik can keep the 24 Hour Children’s Charity on his schedule and we look forward to seeing him in the future.